Ever since the wine tasting in Paris, I've wanted to participate in the very Parisian summertime activity of sipping rosé. I'm surprised that I didn't install it on my summer bucket list. After it languishing on my shopping list awhile, I finally purchased a bottle of French pink wine while in Philadelphia. Next, I invited Kate of Seeking Small over for some wine and antipasti last Tuesday evening. Even though I preferred the rosé I tasted at O Chateau, I still liked this selection. It was Rosé de Mouton Cadet, a Bordeaux Rosé from 2013 by Baron Philippe de Rothschild. My go to wine is red, specifically Chianti, but chilled wine goes with summer. It was nice to change it up. The antipasti consisted of parmesan, sharp cheddar, proscuitto, red grapes, along with a several slices of red bell pepper and baguette. With flavorful olive oil for dipping, certo. I also served bruschetta as antipasti but I didn't happen to snap a photo. 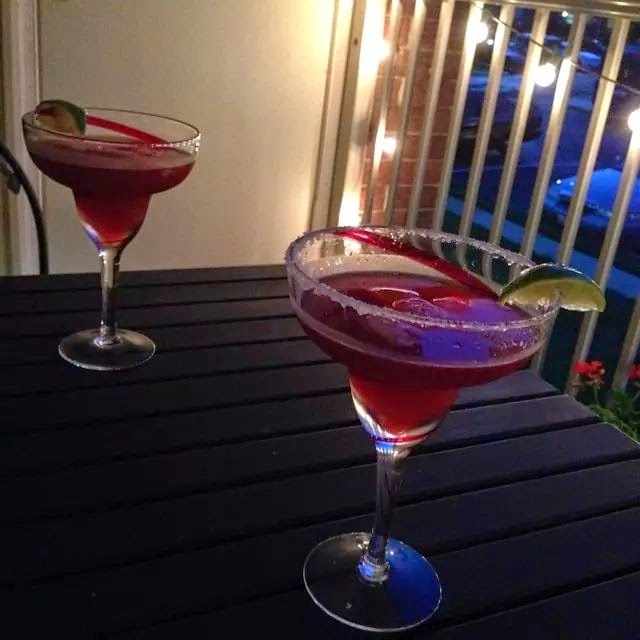 Then, I also mixed up blood orange margaritas along with some chocolate chip cookies I had on hand which we enjoyed on my balcony. It was easy and simple entertaining. It was a fun evening. Being lifestyle bloggers, Kate and I often converse about our values, and of course we caught up with what's going on in each other's lives, but we also indulged in some girl talk. I remember waking up the next morning feeling restored. I think time with a close girlfriend was something I needed. Girl talk might go perfectly with all the pink drink I served too! Btw, if you still want a red wine, try a Bardolino or red Zinfandel/Primitivo. You can drink them fresh, on the bottles it's suggested around 15-16C. A great red wine I tried in Puglia and that is actually served chilled like a white is a Fichimori. I am not sure how available it is in the US, but worth a look. Thank you so much for the wine recommendations! I'll definitely keep those options in mind for the rest of the summer.